Box Text: Become a JEDI MASTER and restore freedom to the galaxy! • Wield your Lightsaber through 20 exclusive NEW levels plus over 200 original! • Use the Force in NEW co-op and competitive multiplayer modes! • Blast Pig Troopers to unlock bonus content on a journey from Tatooine to the Pig Star! Use your controller or go controller-free with Kinect. 02-04-2019 silverbow Box Text Become a JEDI MASTER and restore freedom to the galaxy! • Wield your Lightsaber through 20 exclusive NEW levels plus over 200 original! • Use the Force in NEW co-op and competitive multiplayer modes! • Blast Pig Troopers to unlock bonus content on a journey from Tatooine to the Pig Star! Use your controller or go controller-free with Kinect. 06-18-2018 kreton Box Text Become a Jedi Master and restore freedom to the galaxy! 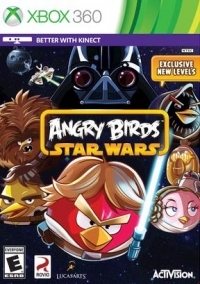 This is a list of VGCollect users who have Angry Birds: Star Wars in their Collection. This is a list of VGCollect users who have Angry Birds: Star Wars in their Sell List. This is a list of VGCollect users who have Angry Birds: Star Wars in their Wish List.